Another Danceteria-shaking triple header awaits as Congress goes into session for another vibed-out Friday! Congress residents and HAHA head honchos D&D kick things off, followed by the debut of the wonderful Love’s Disciple, and a closing set from the untouchable Simon Caldwell! Vibes all night long, just $10 or free before midnight. For a big night, check out HTRK beforehand too, with support from Gareth Psaltis. 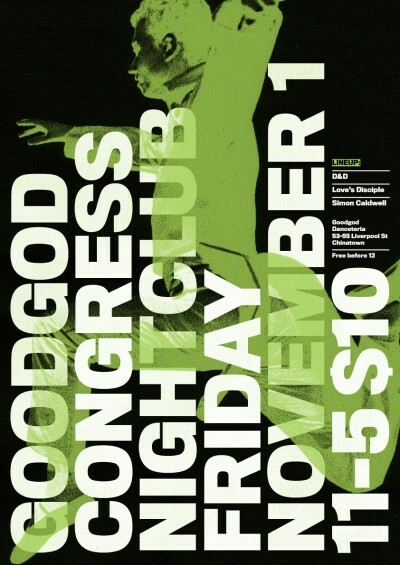 A joint venture from Jimmy Sing (Goodgod Small Club), Magda Bytnerowicz (4our), Vic Edirisinghe (Astral People) and Gardland (Hunter Gatherer), Goodgod Congress is not so much a club night as much as a back-to-basics ethos geared at building a dancefloor Sydney can trust implicitly. For guestlist, email us at info@goodgodgoodgod.com!